This is the last week of the May is for Makers campaign and I have loved every minute of it! This has allowed me to put some intention into my pattern purchasing instead of my usual impulsive shopping. 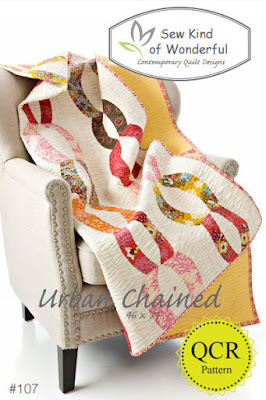 I bit the bullet this week with my #mayisformakers purchase and purchase Urban Chained from Sew Kind of Wonderful. I'm thinking I might have to practice with some of my unloved fabric before cutting into my more precious fat quarters though. Who knew selecting patterns to purchase for May is for Makers would be so difficult! There are so many awesome patterns out there, I have spent way too much time on Pinterest and IG lately trying to make my weekly selections. The pattern I selected this week popped up in my Pinterest and Bloglovin' feeds a few times over the last few months and every time, I liked it more and more. So this week's purchase is Heading South by Material Girl Quilts. I think maybe it's the different sizes for the geese or maybe it's the negative space or maybe it's because this would be another great scrappy quilt to help tame my scraps. I'm not quite sure why, but this one really called out at me! And with that, I'm off to scroll through the #mayisformakers hashtag on IG to try and find next week's pattern! In week 2 of the May is for Makers campaign, I purchased the Gathered Clutch from Noodlehead. And this past weekend, I decided to use the pattern to make myself a new clutch in some of the fat quarters I had been hoarding for a while now. I chose a black fabric for the outside and the accent fabric is a really nice mustard. And I couldn't believe it when I found a zipper that matched that mustard fabric perfectly in my stash! The lining is a grey fabric and I used the same accent mustard fabric for the divider and card holder. The pattern was extremely easy to follow and produces a really nice looking clutch. And with the interfacing, it has just the perfect amount of "stiff", even with just the quilting cotton. And let's face it, that gathered front is a really cute design element. I will be linking up at Crazy Mom Quilts for Finish It Up Friday and at Quilt Matters for TGIFF. I've mentioned this before on this blog: my scrap bins are OVERFLOWING! I swear these scraps multiply when my back is turned! 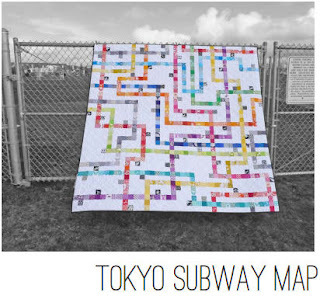 So in an effort to try and reduce the size of my scrap bins, this week's May is for Makers purchase is Tokyo Subway Map by Elizabeth Hartman. What about you? What is the craziest quilt you've ever done? I would love to hear in the comments. Anna is a wonderful, sweet, caring and super funny person who also happens to be my oldest son's girlfriend. According to our son, Anna is constantly "stealing" his quilt when napping on the couch so he requested that I make one for her. Anna is a hair dresser and she's basically been doing the whole family's hair now for free for six months - the least I could do is make her a quilt! And I had this quilt in my sketch book for a long time and thought it was time for it to become a quilt. I used Kona cottons for the whole thing: White, Delft, Cloud and Kumquat for the binding. I love how this design looks and yet it was so simple - just a bunch of half-square triangles! For the quilting, I stitched straight lines echoing the piecing in the light chevrons and some flowers in the darker chevron and the top and bottom borders. 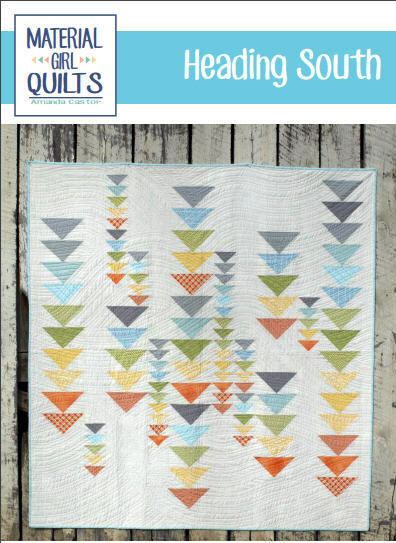 This quilt is number 6 on my Q2 2016 FAL list. 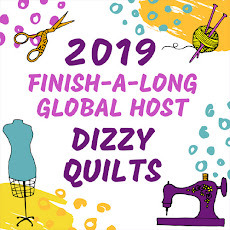 I will also be linking up at Crazy Mom Quilts for Finish It Up Friday and at Quokka Quilts for TGIFF. The Summer is finally around the corner so for week 2, I decided I needed a small purse to carry around when walking the dog or running errands. I did a little bit of research on the web and, in the end, chose to go with Noodlehead's Gathered Clutch. All I need now is to find the time to get a couple of these sewn up! My sweetie's niece had a baby girl 6 months ago. But she lives all the way in Edmonton so we haven't seen her yet. When I found out a few weeks ago that Ava and her mom were coming for a visit this week, I knew I had to make a baby quilt! I love Elizabeth Hartman's patterns so I decided to make little Ava a Bjorn the Bear quilt. I pulled nine pink fat quarters from my stash (some Cotton and Steel, some Blueberry Park and other really cool prints), and used Kona Espresso and Kona White for the bears. For the background, I went with Kona Latte. I needed to finish this one quickly so once again, I went with a big meander. The backing is a really sweet pink print I purchased a few months ago. And for the binding, I used a pink stripe which I absolutely love! Bjorn the Bear finishes at about 44" square. 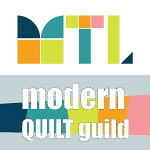 Will be linking up at Crazy Mom Quilts for Finish It Up Friday and at Quilt Matters for TGIFF. Last week, Lindsey from LR Stitched, launched a campaign to bring awareness to the work of pattern designers. In her blog post, she mentions that "the balance between what we expect for free and what we are willing to purchase is way out of whack". I'm not a pattern designer, and I learned so much from the free tutorials I found on the Internet, that I needed to give back. I plan on purchasing a pattern from an independent pattern designer every week during the month of May and encourage you to do the same. This week, I purchased Broken Frames by Meadow Mist Designs. Cheryl is a fabulous designer, and extremely generous with her time and talent. 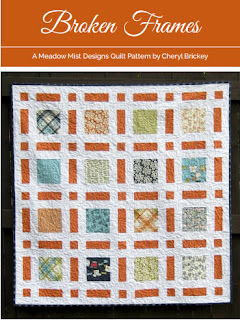 She's hosted quilt-alongs, she's written free tutorials and her designs are modern, creative and super fun! Please participate by purchasing patterns this month and share your purchases with the #mayisformakers hashtag on Instagram. Are there any pattern designers you would recommend? I would love to hear in the comments.